'Conan the Barbarian' #1 review: A return to sword, sorcery, and the weird – AiPT! 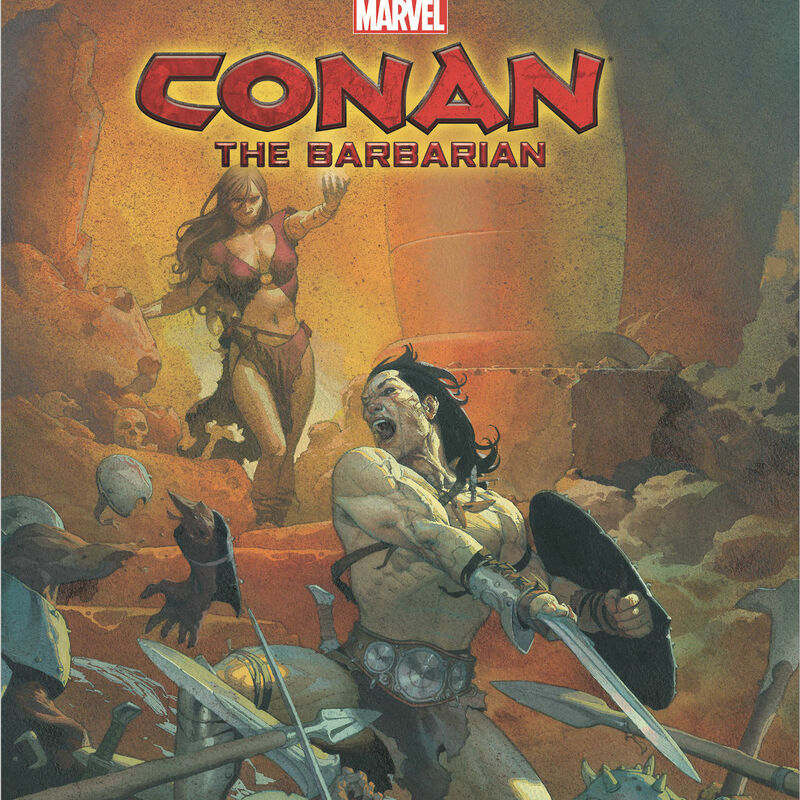 It has been a year of waiting since Marvel Comics revealed they would take Conan the Barbarian back into the fold. Dark Horse took hold of the property in 2003, producing some of the best Conan stories ever, such as Kurt Busiek and Cary Nord’s incredible run. It’s without a doubt that they did the character justice over their 15 years. Truth is, Stan Lee and Marvel started Conan’s comic book success back in 1970 with 275 issues to their name. That legacy continues this week with Jason Aaron and Mahmud Asrar taking the series in a new direction. From an age undreamed…hither came Conan the Cimmerian, black-haired, sullen-eyed, sword in hand, a thief, a reaver, a slayer, with gigantic melancholies and gigantic mirth, to tread the jeweled thrones of the Earth under his sandaled feet… Robert E. Howard’s creation returns to comics, in an epic tale as only MARVEL could bring you! Conan’s travels have brought him to the far reaches of the unkown, from his birthplace in Cimmeria to the kingdom of Aquilonia and all in between. As his fighting prowess allows him to carve his way through life, so too does it attract the forces of death! This all-new ages-spanning saga forever changes Conan’s destiny! Conan the Barbarian holds a special place in many comic book fans’ hearts. The character is a sort of promise of another time when magic was real but rare, hard work was paid with wine and gold, and the only thing that could slow down the strongest Cimmerian of them all was trickery. Conan is a character that can do anything thanks to his quick foot, his clever thinking, and his incredible strength. It’s a character who lives in a simpler time when spilling blood could solve all your problems. Having read a good deal of Conan the Barbarian, stories it’s very safe to say this new title is in good hands. Like a love letter, this issue opens reveling in the history of the character (and indeed editor Mark Brasso points out Legacy numbering is in full effect here) while also delivering an introduction to new readers young and old. It opens with a quote, then turning to a collage of moments from Conan’s run in Marvel Comics. In these three pages, it’s made very clear the character is being handled carefully and with great love. The story that unfolds henceforce is proof to the promise. New fans are going to easily get into this book, although maybe not very young fans. A lot of blood does flow and heads do get lopped off. This book delivers on everything that makes Conan great, whether it’s his strength, his tenacity, or his love of women and wine. This book lives up to the aptly titled barbarian in more ways than one. Opening with two full-page splashes and following that a double page splash it’s made clear this is an epic tale that spans time, many deaths, and a hero’s journey like no other. Speaking of those opening pages, Jason Aaron does a fantastic job establishing Conan’s legacy, first being born on a battlefield, then becoming king, and then cutting to when he was younger fighting men for gold and wine. His life is storied and the way this issue is plotted that is made very clear. I won’t spoil another thing, but there are plenty of fight scenes, magic afoot, and a promise by the end that Conan may be facing his most challenging battle yet. The art by Asrar is incredibly well done. I can’t help but marvel at how Asrar seems to only get better with each passing year. There are many splash pages in this book that dazzle using foreground and background to draw your eye. There seems to be no expense paid on details either with easy to follow action that’ll have you on the edge of your seat. His ability to move the camera around is quite well done too. There are some intense grotesqueries, one of which has a dangling blue tongue that’ll make you squeal “Ick.” It’s easy for some to categorize Conan as simply a muscular dude with sword skills, but when you see the enemies he faces you’ll think twice and Asrar captures the monstrosities well. Matthew Wilson brings his A-game as well. The color is a bit more muted than his work on Thor, given the material, though it is textured and captures the atmosphere well. A simple shadow on bystanders watching a gladiatorial fight, the rush of blood, or that godawful blue tongue are striking and bold. And speaking of visuals, VC’s Travis Lanham does a great job with sound effects and a slightly rougher lettering. The collage feels like a love letter. I was hoping for a more whistful storybook feel from the captions. Instead, the story uses captions sparingly and when they are used they are very matter of fact. “The air smelled of sweat and cheap ale” and “A roar unlike anything that could be produced by mortal tongue” speaks plainly and with little dramatic gusto. I’m still trying to get a bead on the narrator’s voice and their purpose.